At Panorama und Wellness Cp. 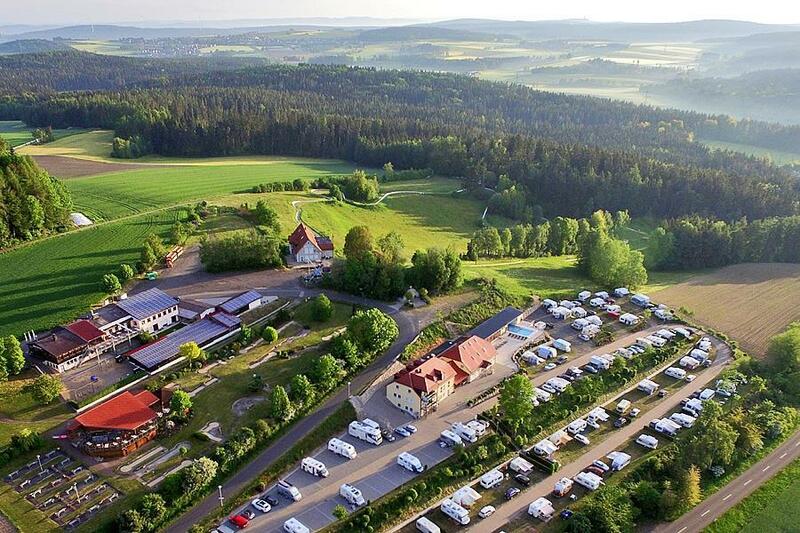 Großbüchlberg in Mitterteich (Bavaria) camping costs as little as €20,- per night during low season with CampingCard ACSI. At one of the 60 touring pitches you will get a discounted rate during the period 01-01-2019 - 15-07-2019 and 01-09-2019 - 31-12-2019. At this campsite you can not only use your CampingCard ACSI for inexpensive camping, you can also use your ACSI Club ID (as an alternative ID). Site with two terraces, 600 metres high. 5 km from A93 and 15 km from Czech Republic. 300 m² spa oasis with pool, relaxation room, sauna, steam bath, toilet facilities easily accessible. Every pitch: electricity, water, drainage and wifi. 3 children up to and including 5 years free. Wow what a little gem, in a fabulous location, with wonderfull views. The sanitary facilities are first class. So peacefull and tranqui. The wellness centre is a fantastic bonus with the outside swimming pool heated to 32deg in october!! You can chose to stay on grass or hard standing with all pitches fully serviced. Great value for Money and the template for other campsites to aspire too. Would you like to book Panorama und Wellness Cp. Großbüchlberg or request more information? You can do both using the information below. A93 exit 17 or 16, then to Mitterteich. At crossroads with traffic lights in town centre follow 'freizeithugl'. Left after 200m to Großbüchlberg. There, after town sign, right and follow signs. CampingCard ACSI will send your information request to "Panorama und Wellness Cp. Großbüchlberg".